Strength and beauty – a timeless, winning combination. Whether it’s lighting support, a complete roof system, a striking exhibition stand or an arresting retail display, let Metalworx turn your vision into reality. 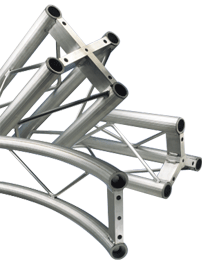 Incorporating our unique alignment and connection components, resulting in clean, smooth and snag-free lines, our range of structural aluminium systems, together with a quarter of a century of custom fabrication expertise, can provide you with an affordable solution to your equipment support or aesthetic construction project. Our ethos is to talk with you and fully understand your needs, and then deliver an eye-catching, safe and cost-effective realisation of your ideas. For this reason you won’t find component prices here, but we think you’ll be pleasantly surprised when you discover the finished cost of your project. To us, your second order is more important than your first! Ecommerce website © FAT promotions 2013. All rights reserved.